From bone-in to boneless, these Colorado chicken wing joints can cure your wing craving. Buffalo-style wings may be the norm, but prepare to get a little adventurous as well at these great spots. No matter if you’re in search for the best wing for the Super Bowl or just another date night, these 10 best chicken wing spots in Colorado have got you covered. With gluten-free options and a choice of chicken wings and even “pig wings,” you can really have your wings the way you want them at Grillin’ Wings & Things. 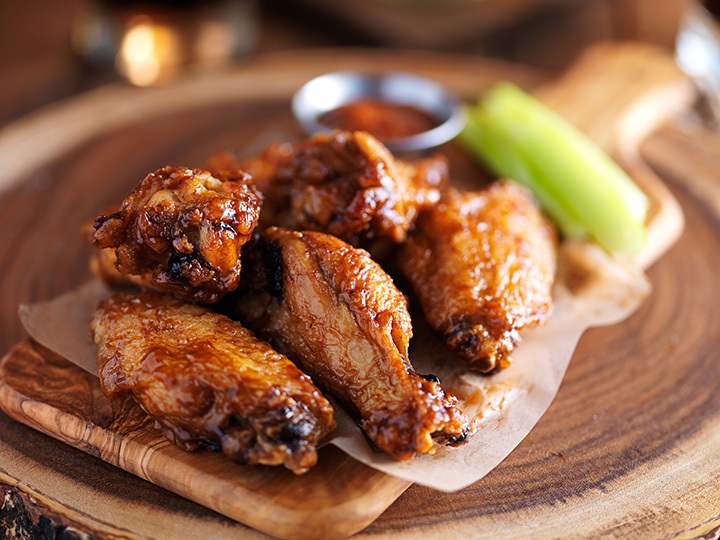 The traditional Buffalo wings are definitely a fan favorite. However don’t be afraid to branch out into different sauces with the sweet ginger Thai sauce or the mango habanero. Fire on The Mountain is known for homemade sauces, meat from locally-raised chickens and crispy wings. If you aren’t a wing fan, Fire on The Mountain even offers burgers and food for vegetarians and vegans. But wings are the name of the game here, especially spicy ones. Attempt the excruciatingly hot El Jefe sauce, which was featured on the Food Network. Or try a unique sauce such as bourbon chipotle or raspberry habanero. With five locations in northern Colorado, you can easily get some great wings from Wing Shack when you’re in the area. This locally-owned wing joint offers wings doused in your choice of 12 homemade sauces. This restaurant is known for its Buffalo-style hot wings but all sauce choices are top notch, such as garlic Cajun or honey barbeque. If those sauce options aren’t wacky enough for you, try the sauce of the month. CD’s Wings has been serving up great wings since 2007. All sauces are made in-house and vary in spiciness and style. Dry rubs and saturated sauces are both offered, along with Asian-style wings and classic Buffalo. CD’s loves catering to football fans by offering specials during football season. Get your wing and beer on at the Wing Hut in Aurora. This family-owned wing joint not only offers bone-in wings but also boneless wings and chicken tenders. There isn’t just one Buffalo sauce option at the Wing Hut, there are many and they all range from mild to way too hot. Head to Fort Collins to visit Jim’s Wings, a wing establishment that has been opened since 1991. The homemade ranch and sauces at Jim’s, which you can purchase by the bottle, is enough to make your visit. Stay for the wings, beer and unique sauce of the month. The Chicken Shack, a family-owned wing joint, opened in 2015 but has made a name for itself by offering some incredible and finger-licking wing options, along with homemade ranch. The chicken here is always fresh and never frozen and every single wing is hand-breaded to perfection. With a choice of 31 options, the wing fanatic is sure to find a great combination at The Chicken Shack. Winging It! has been pleasing locals for more than 14 years. The sauce fanatic and sauce snob must visit this family-owned wing joint. With over 52 homemade sauces, the most sauce options out of any restaurant on this list, Wingin It! is here to please. Find some incredible wings at Willy’s Wings in Morrison. For more than 15 years, Willy’s has been serving up wings to satisfied Coloradans. The Buffalo-style chicken wings can be tossed with 15 different sauces. This biker bar may not be classified as a wing joint but it made a name for itself through its awesome chicken wings. Find your classic buffalo-style wing or a Chinese-style wing. The sauce recipe is secret, so don’t bother asking. Even a bike-less wing lover is welcome at this dive bar.